The Black Cats aren’t in action this afternoon with players away on international duty, while they head to Wembley next weekend, to face Portsmouth in the Checkatrade Trophy Final. It means the next time that Jack Ross’s side have a league game, at Accrington on Wednesday, April 3, Luton could well be up to 13 points ahead of them, albeit having played three games more. Harford said: “We’d like that, it’s a big challenge, Sunderland I think have eight games in April, which is a massive amount of games and will put a lot of pressure on them. “As I keep repeating myself, I keep saying to the players, we’ve just got to look after ourselves. “We look after our squad, our players, how we go about our business and we can’t affect what happens. “Sunderland through their own success, having good players who have now gone off on international duty, by getting to the Checkatrade Trophy, they’ve had a successful season in terms of that. Midfielder Pelly-Ruddock Mpanzu knows that Town can't afford to drop their focus during the run-in, saying: "Barnsley are a good team, they’re trying to catch us, we’re trying to pull away from them. "We're always going to be watching Barnsley and Sunderland who are behind us, but we've got to be focused on our own game and keep it going. “Sunderland are a strong team, they're trying to get back up, trying to chase us. "Hopefully they drop points and we can get away from the other teams." 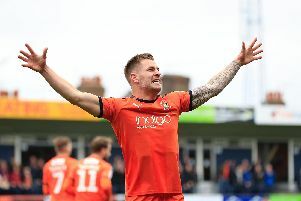 Luton have a fairly simple run-in in terms of scheduling now, having got through their worst period relatively unscathed, taking four points from midweek games at Plymouth and Bradford in the space of four days. They followed that up with another point against Gillingham last weekend, leaving them a full week to prepare for Doncaster this afternoon. Harford added: “The week’s been great, we’ve had a good week, we’ve rested them, we’ve worked them, trained well, they’re up for the challenge, absolutely. “We’re not making any excuses, a lot of teams have to do that (travelling), we’ll overcome that. “We were happy with the points haul we got over those two or three games.